Thinking about real estate coaching? There are lots of folks out there who call themselves “coaches”, but few have the experience or credentials that you should demand for your success. Before you sign a contract or commit to any real estate coach, make them answer these important questions below. With over a three decades of real estate & coaching experience, Tim & Julie Harris are your go-to resource for the highest quality real estate coaching & training programs. As you read through the questions below, think about how our organization answers them – and make the right choice for your career. 1. What qualifies you to be a coach? 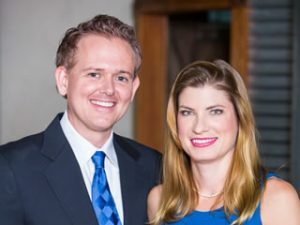 The National Association of Realtors® has featured Tim & Julie in articles about their real estate sales success, and in 1998 they were recruited to become Howard Brinton Stars, introducing them to real estate coaching and training. Tim and Julie started coaching agents in 1998. From 2002 to 2007, they worked with other coaching organizations as coaches and executives. Tim and Julie Harris are honored to have coached many of the nation’s top producing agents. From 2007 to the present Tim & Julie have become two of the industry’s leading coaches. 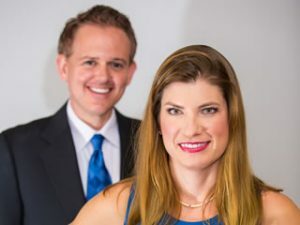 Inman News named Tim and Julie Harris as the “Best Coaches in the industry.” They have written several books including, Think and Grow Rich for Real Estate, The Real Estate Treasure Map, and Part Time Agent to Full-Time Superstar. Their newest book, HARRIS RULES, became a #1 Best Seller on Amazon.com within 48 hours of release. As experienced real-estate coaches, having coached agents in nearly every real estate market and price range Tim & Julie Harris have seen the danger of relying on a single strategy for real estate success. They’ve developed their coaching programs to provide comprehensive education on a wide variety of “spokes in the wheel” of your real estate business. 2. Who will my actual coach be and what are their qualifications? Every one of our new coaching clients starts their coaching relationship with a trained, experienced member of our real estate coaching team. Our coaches are all licensed, top-producing real estate professionals, who spend the time to learn your personal goals, unique strengths, and areas for improvement. Maybe for the first time you will establish goals, set priorities, and get into action on the road to real estate success. Other coaching companies are more interested in your money than your success, so when you enroll, instead of being assigned to an expert real estate coach, you’ll end up with a script-reading employee, who typically has never sold real estate and often has no industry qualifications. That’s why it’s very important to find out who your actual coach is going to be. You need to be confident that the person you’re going to meet with on a regular basis is capable of understanding your individual goals & needs, and able to help you create the action plan that leads you to real estate mastery. 3. Have you (and my prospective coach) ever sold real estate? 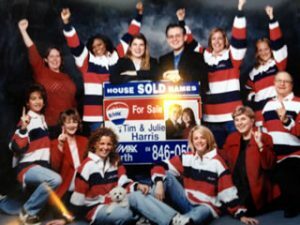 Tim & Julie Harris spent a decade as top-producing agents, sold over 100 homes their first year in the business, and earned the Re/Max Platinum Award and numerous other honors throughout their career. They’ve got experience with the entire process of building a successful real estate business from the ground up. In addition, every single member of our coaching staff is a trained, licensed, practicing real estate professional – all with decades of top-producing real estate experience. Our competitors can’t say the same thing: Would it surprised you to know that our main competitors NEVER sold real estate or haven’t sold real estate for 3-4 decades. Given a choice, doesn’t it just make sense to hire a coach that has truly been there and done that…vs someone who just read about in a book? 4. Does your coaching company have a financing program? In order to provide the highest quality of service possible for our clients, we are proud to have partnered with UGA financing to provide a affordable financing programs for our real estate coaching & training programs. We’re the only real estate coaching company that provides this level of financial flexibility, because we’re committed to helping you succeed in real estate, no matter where you start out in the industry. Misleading coaching contracts have become a serious issue in real estate coaching, because literally thousands of agents have been taken advantage of by unscrupulous coaching organizations. If you want to learn more about this, the Wall Street Journal has covered this scandal in-depth. 5. How many coaching clients does my coach currently coach? In addition to limiting the clients for each coach, we also limit the number of agents we coach in each MLS area. You will NOT be going “head to head” with a bunch of our other members in your local market area….we are careful to not create a new competitor in your back yard! If your area is closed you will be added to the wait list for your MLS area. 6. Can I listen to real coaching calls from one of your coaches before I hire you? Yes, absolutely! Here are audio links to some example coaching calls. Listen in now as Head Coach Julie Harris conducts 3 calls with 3 different agents. These calls were recently featured by Inman News in “Inman listens in: how coaching calls really work”, which discusses the value that real estate coaching offers to agents. 7. Will I have control over my coaching call schedule? With us your coaching calls will be on the same day and time. If you need to reschedule..no worries. You will be given direct access to your coaches schedule to reschedule your call if needed. Your schedule is yours – our coaches don’t move calls. Your day and your time is YOUR DAY AND YOUR TIME. Our competition can’t make this claim: organizations running high-volume “body shops” can’t provide the quality of service, attention to detail, or commitment to your success that we can, and scheduling is one of many areas in their service that suffers as a result. 8. Can I choose my coach and switch coaches if I want to? Your success in real estate coaching depends on finding the best coach to complement your own personal style, business challenges, market conditions, and more. Will your prospective coaching company allow you to switch coaches, or are you “assigned” to a coach and then stuck with them throughout your coaching program? Tim & Julie Harris allow you to choose from among the licensed, professional coaches on our trained, professional coaching staff – and at your request, we allow you to switch coaches up to once a month. Maybe you feel like your coach doesn’t understand you, or maybe you want to sample the experience of various top-producing coaches on our team. Whatever the reason, we let you find the best coach to suit your needs and build a solid professional relationship with over time. 9. What comprehensive training materials do I get IN ADDITION to coaching calls? We provide you with industry leading training curriculum, including our industry-leading Premier Coaching Program containing forms, scripts, objection handlers, a complete Pre-Listing Package & Listing-Presentation and literally hundreds of hours of specialty training via streaming video & audio downloads. 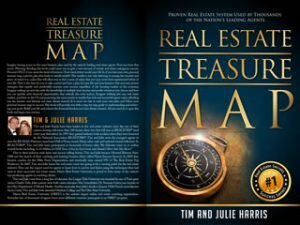 In addition, our program contains the “Real Estate Treasure Map” – Tim & Julie’s step-by-step, fill in the blanks business plan for real estate success, along with lead generation tools, pre-listing packages, listing presentations, buyer presentations, negotiating tools, access to our handpicked vendor network, and much more. It’s a business in a box, with everything you need for your real estate business. 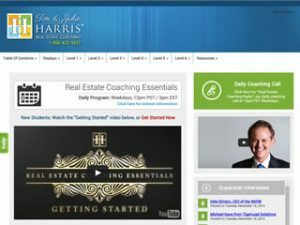 Watch this video for a walkthrough of the Real Estate Coaching Essentials program. This comprehensive, web-based repository of coaching & training material is in addition to your regularly scheduled 1-on-1 coaching calls. It literally distills decades of real estate experience in a step-by-step, seamless training experience available on-demand whenever you need it. 10. 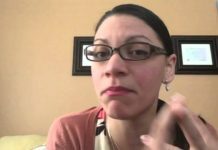 Can you show me an example of what type of plan of action you will provide for me? Yes, thanks for asking! Each of our coaching members develops their own, unique action plan based on their own goals, strengths, and local market conditions, but we provide some common business planning tools that all agents will benefit from. To get a better feel for our approach to your individual action plan, download a free copy of our business plan, The Real Estate Treasure Map. Included is a free copy of one of Tim and Julie’s books, Think and Grow Rich: Real Estate Edition. You can also grab a free copy of our 90-Day Massive Action Plan. Often we use this plan for agents who need to build momentum fast. 11. How exactly will my coaching experience be personalized for me so that it is a perfect match for my style? We believe in personalized coaching based on YOU, your market, your natural style and your specific goals. Our business plan, the Real Estate Treasure Map, pulls this information out and allows us to coach you to your strengths and minimize your weaknesses. We’re the only company that personalizes your coaching. Our competitors focus on gimmicks, which is why they’re known by what they teach, instead of by teaching agents unique skillsets designed to meet their individual needs. One of our competitors teaches “cold calling”, another teaches “Facebook & Twitter”, and yet another teaches “real estate by referral”. Instead of simply pushing a specific technique, we focus on delivering what’s best for your own unique situation. 12. Will you (or my prospective coach) ever coach me to use illegal or unethical practices? Tim & Julie Harris coaching programs are founded on the best ethical practices used by top-producing agents in today’s industry. We will NEVER, ever ask you to do anything illegal or unethical. Our real estate practice was based on personal integrity and providing outstanding service to our buyers and sellers – and those principles of integrity are the foundation of our coaching practice today. 13. Will I be the only person on the call with my coach or are my coaching calls shared? Tim & Julie Harris® Real Estate Coaching provides 1-on-1 professional real estate coaching based on YOUR unique strengths & goals – that’s something that requires a personal, 1-on-1 interaction. That’s why, depending on your coaching program, you will always be the only one on the call with your coach (unless you wish to have a spouse, partner or team member with you on the call) Premier Coaching members receive a DAILY Semi-Private coaching Session with head coach Julie Harris. Our competitors can’t make the same claim. They might promise you personalized coaching, but if they place you into a large group call setting led by a script-reader, ask yourself how personalized this “body shop” approach to coaching really is. 14. Do your coaches read from scripts or pre-written coaching call outlines? Most of our competitors have folks they call “coaches”, but who have never actually sold real estate. This forces them to be dependent on reading coaching scripts to make up for their lack of real experience – and it means that when you ask them real world questions about real estate, they just can’t give you a straight answer. Our coaches are different – all of our coaches are licensed, active sales people with a documented real estate sales history in boom and distressed markets. This allows our coaches to coach from experience, excellent coaches training and the real world that our clients face. We have walked in their shoes. 15. Will I be coerced into attending live events or spending more money AFTER I join your coaching organization? Other coaching companies continue to upsell you once you’ve made a basic commitment – they say you need to spend more to make the coaching program “really work” (and if it doesn’t work, they claim it’s because YOU didn’t work it hard enough). The extra expenditure required makes your monthly bill a lot more than you expected. We don’t do that. We work hard to provide overwhelming value to our clients on every call. Any additional expenditure happens on special projects like upgrading presentations, etc, and are budgeted for and built into the Treasure Map (business plan). No additional expenditure is ever ‘required’ to make our coaching ‘work’. The same thing applies to live “events” promoted by the competition: those events are actually thinly-disguised sales rallies designed to ‘upsell’ you into a more expensive coaching program. In contrast, we have a daily radio show, occasional live events, and of course your regularly scheduled coaching calls. You are not coerced or required to attend anything additional, but our radio show is very popular and a great supplement to your regular coaching. 16. Do you have provable experience in other aspects of real estate: (new construction, investing, distressed)? Absolutely. Our coaching staff is experienced in Luxury Home Sales, standard equity sales, distressed sales, REOs, BPOs, Short Sales, Corporate and voluntary relocation, new construction, flips and property management. This is important since different clients gravitate toward certain aspects of real estate, and different markets and market conditions call for pivoting toward new opportunities. True success in real estate involves mastering the basic principles of real estate sales, but needs to go a lot further than that to help you build a rewarding, profitable career. Being able to specialize areas such as new construction or distressed properties gives you the ability to better define your market niche & grow in a way that makes sense based on your strengths & local market conditions. 17. How many different forms of lead generation will I learn? We believe in a strong and balanced combination of lead sources that are appropriate to our client, their personality, market place, budget and skills. Our clients can choose from up to 50 different methods of generating business, not just one that may or may not fit their needs. The competition can’t say this – our competitors focus exclusively buying leads, easy button gimmicks, referral based real estate, which have their place as lead-generation tools, but shouldn’t be used exclusively as the basis of your business. If the recession taught agents anything, it’s that you CAN’T rely on a single source of leads for financial security. 18. How successful are your coaching members, and can you provide examples? Based on a survey our Elite Coaching clients average closes 76 homes a year, has 99.4% of list price vs. the average in each market (list to sell price-ratio), and our client listings have far less than average days-on-market, many are less than 10 DOM due to some of the techniques our clients understand regarding pricing, marketing and negotiating. Another way of looking at it is to look at the Return On Investment (ROI) of each coaching dollar you spend. As a business owner, you must look at each dollar spent and ask what you can expect in return. According to a recent poll of our clients, well more than $10 returned vs. every $1 spent. Want to see what kind of results our coaching programs produce? Listen to the interviews below with successful Tim & Julie Harris® Real Estate Coaching clients, where they provide unsolicited testimonials for us on the effectivenes of our coaching programs in helping them to achieve success in today’s real estate marketplace. 19. How long will it take for me to see actual results (money in the bank) from your coaching program? As fast as you get to work implementing what we ask of you. It’s not unusual to see nearly immediate results, due to our very targeted, direct approach. Once we establish what your goals are, it’s time to get to work! Because we don’t believe in forcing a round peg into a square hole, but instead believe in bringing out the BEST in you, we get results faster and with less pain than other companies who believe in ‘their way or the highway’.You got into real estate to create the life of your dreams, and you’re looking to help make that dream a reality. Let’s get to that as soon as possible. 20. Are your coaches certified? Real Estate is a sales profession, and because of this it contains a collection of skills that simply can’t be taught in school. Becoming an expert real estate agent requires either years of industry experience or the guidance of an experienced professional willing to share their knowledge, experience, and trade secrets. The challenge that many agents face is finding a mentor to coach them – as well as the larger issue of finding a quality mentor with a track record of success worth learning from. This need for reliable examples of success for agents to learn from led to the birth of modern real estate coaching, which we credit to Howard Brinton. 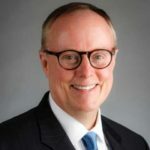 While many real estate coaching “gurus” have tried to claim the coveted distinction of being the founder of real estate coaching, the truth is that only Howard Brinton was the first to truly train agents in a comprehensive “office model” for real estate success, which evolved later into the “Star Power” series he launched in 1989. Inman wrote a tribute to Brinton’s legacy after his tragic passing in 2013. The National Association of Realtors® is a big, non-partisan advocate of real estate coaching, and released statistics in 2013 which unequivocally state that “10% of agents complete 90% of all real estate transactions…because they have a coach”. Inman News has also discussed the value of real estate coaching in detail, with “Special report: Real estate coaching’s payoff”, and published their own statistics, which indicate that three quarters of all coaching members see a remarkable 50% to 200% increase in volume from coaching. Their analysis seems to echo agent sentiments in the industry itself – of the thousands of agents polled for the Inman article, over 90% of agents responded that real estate coaching was a worthwhile investment. 3. What Kind Of Results Does Coaching Produce? The actual results of real estate coaching depend on the individual agent, but our “average” client sells 76 homes a year, has 99.4% of list price vs. the average in each market (list to sell price-ratio), and our client listings have far less than average days-on-market, many are less than 10 days-on-market due to some of the techniques our clients understand regarding pricing, marketing and negotiating. In terms of intrinsic value to the individual agent, our experience is that agents who make the initial commitment to begin our coaching programs typically don’t quit them – which we attribute to our combination of empowering agents with tools, techniques, and training – as well as providing agents with the accountability they need to stay on-track. Agents who start coaching stick with it, because it makes financial sense & gives them peace of mind. 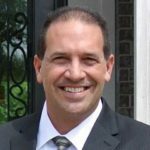 As you may have guessed from many of the questions on this website, there are a number of poorly-qualified real estate “gurus” claiming to be coaches who hurt the reputation of true professional coaching companies. As career real estate professionals, we take pride in our tradecraft and strive to help agents pick the best coach for their own individual needs – based on the qualifications of the coach, not on cheap marketing tactics and sales gimmicks. It’s time to clean up real estate coaching – so if you’re comparing coaches online, review the details of each coach and then vote with your wallet for the team you think best represents your path to real estate success. Modern coaching takes place on the phone & internet, so why attend a “live event” by a coaching company? The answer is simple: those live events are actually thinly-disguised sales rallies designed to ‘upsell’ you into a more expensive coaching program. They rely on high-pressure tactics and group psychology to get you to sign a contract that you’ll regret later…a contract with no “buyer’s remorse” clause. What is a coaching “body shop”? It’s an organization with professional salespeople to get you to sign a contract, and then place you with a “script reader” who walks you through a training manual, step by step, whether or not it applies to your individual business needs or challenges. A recent trend has been telling agents that they don’t need coaching if they simply buy leads. However, that just ain’t true! The vast majority of internet buyers inquire with multiple agents, leaving a trail of leads across various websites that you end up paying big bucks for! Your website, social media profile, Facebook network, and the rest of it is not what’s going to make or break your production. If you’re like most agents, it will never even generate a sale for you! Don’t get distracted from true real estate skills mastery with CRMs, websites, and online technology that promises you the moon but delivers very little. Listen to real example coaching calls using the audio player links below. Listen in now as Head Coach Julie Harris conducts 3 calls with 3 different agents. These calls were recently featured by Inman News in “Inman listens in: how coaching calls really work”, which discusses the value that real estate coaching offers to agents. 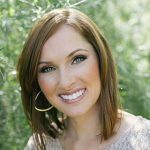 Listen to coach Julie Harris work with Andrea to resolve her issues with prospecting & lead-generation. 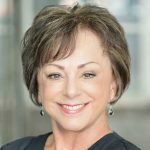 Listen to coach Julie Harris work with Gail to help her expand her real estate network and Center-Of-Influence.